The simple answer for "What is Alternative energy" is - it is an energy source that can be used as an alternative of fossil fuel namely- coal, petroleum and natural gas. Alternative energies are derived or generated from sources without using up natural resources or producing any harmful effect to the environment. 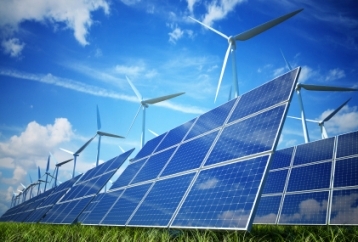 Alternative energy is also referred as Renewable Energy as it comes from resources that are continually get replenishes such as sunlight, wind, waves, tide and geothermal heat. The major form of Alternative and renewable energy are biogas, solar power energy and wind energy. It also includes electricity and heat generated from solar, wind, ocean, hydropower, biomass, geothermal resources, and biofuels and hydrogen derived from renewable resources. Fossil fuels are non-renewable resources because they take millions of years to form, and their reserves are being depleted much faster than new ones are being made. Therefore to keep up with the increased energy demands generation and use of alternative energy is getting more and more demand. The burning of fossil fuels produces around 21.3 billion tonnes (21.3 gigatonnes) of carbon dioxide (CO2) per year, but it is estimated that natural processes can only absorb about half of that amount, so there is a net increase of 10.65 billion tonnes of atmospheric carbon dioxide per year. Carbon dioxide is one of the major contributors to the global warming - an increase in earth’s average temperature that poses a great threat to cause major adverse effects. Burning of fossil fuel such as coal emits toxic substances such as sulphur dioxide, lead, mercury and other heavy metals that known to cause serious health problems, including cancer. Generating and using alternative energy will reduce import of fossil fuel and electricity. This will also insulate the economy from fossil fuel price spikes due to supply shortage or disruptions. Generation and production of alternative energy will increase economic development and job creation. Use of alternative energy does not deplete natural resources and conserve it for future generations. Thus uses of alternative energy meet the needs of people today and in the future in an accessible, equitable and efficient manner. Go back to the Eco Ambassador Home!